Now, I know that the Anglicans have skipped along the cliff quite a bit, but I wondered if the sign really meant what it said. In typically leftist fashion, the message is somewhat ambiguous. 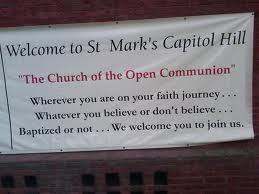 It mentions “open communion,” but then it proclaims a welcome for everyone to join them. However, most if not all Christian groups welcome visitors to their services. We stopped kicking the heathen (and the catechumens) out mid-liturgy ages ago. How, then, are our Capitol Hill Anglicans especially open? The parish web site clarifies it: What is “Open Communion”? At St. Mark’s, we welcome everyone to celebrate Eucharist with us. We believe in the inherent value of all travelers in this life journey; “open communion” reminds the parishioners and visitors that all are invited to the Lord’s table. Surrounding a central altar, all participants, regardless of whether or not they have been baptized, join together shoulder to shoulder to share the gifts of bread and wine. After searching a bit online, I discovered that “communing” the unbaptized is actually against Anglican ecclesial canons, though the practice is widespread among Episcopalians. What on earth (or in hell) is wrong with the Anglicans in this country? They disregard the sanctity of marriage and preach sexual “liberation.” Then, they ignore the fundamental distinction for Christians between the baptized and the unbaptized with regard to the Eucharist. I see parallels there. Of course, I do not think that the Anglicans have real sacraments, but their former ideas and attitudes toward Christian practices and doctrines were much closer to the apostolic faith. Their minds and hearts had been well paved for conversion to the Church. Currently, though, they are becoming more similar to pagans, having no proper inner formation that would prepare them for Christianity. Moreover, traditional pagan sects have a better understanding of the divine and the world. Contemporary Episcopagans do not even have the advantages of natural religion. Having forsaken nature and cosmic order in pursuit of the idol of ego worship, they are further inoculated against learning the gospel by having ingested a counterfeit christ. Instead of the eternal Pantokrator, they have the soothing Gaia Spirit that assures them that they and everything that they have ever done are good—just the way they are. A rather timely faith, I’d say. Little more than a decade ago, my brother Aaron and I spent a day in Kronstadt—a naval town on an island in the Gulf of Finland. 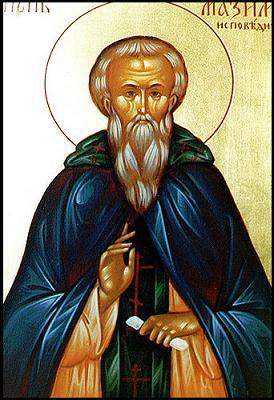 We arrived by bus from the Saint Petersburg, and we commenced to search for any memorials or parishes associated with Saint John of Kronstadt, as Saint Andrew’s Cathedral where Saint John chiefly served had been destroyed by the Soviets. We found none. After spending the entire day searching in vain, we returned to the bus stop. Behind the stop, I noticed a church under renovation. I thought that it might be worth asking about before we left. A family allowed us to enter the edifice, which turned out to be the city’s Vladimir Sobor—the main church in the city after Saint Andrew’s before the construction of Saint Nicholas’ Naval Sobor. I do not know how often Saint John served at Our Lady of Vladimir, but it seems likely. While we earlier sought to retrace Saint John’s life, we got to see Kronstadt, which had been closed to foreigners until a few years before. During the day, we came to the grandest building on the island—the remains of Saint Nicholas’ Naval Sobor. I found a caretaker to let us in, and I was saddened to see an auditorium inside. It clearly had been a lovely temple, but the Communists had perverted it into a cinema. Even in its secularized state, it seemed neglected. Wherever we went in Russia, we were constantly reminded by the evil done after the revolution. It was thus with great joy that I read about the reconsecration of the Naval Sobor in April of this year on A.O.I. 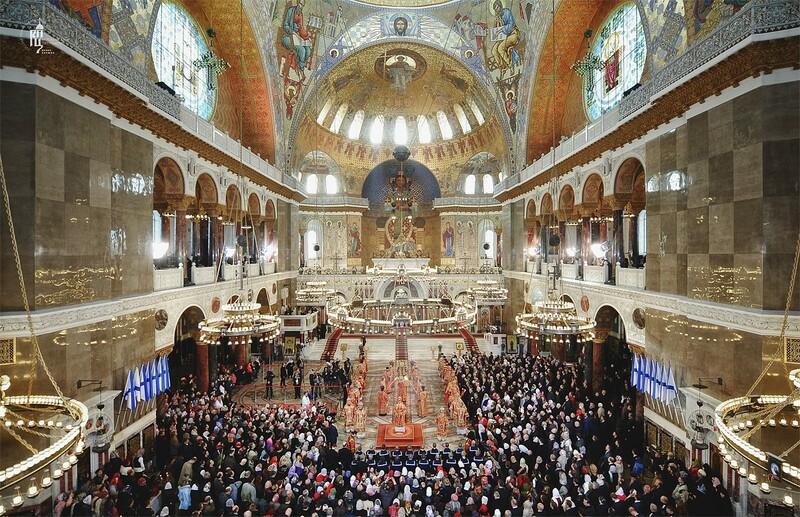 : “Is This the Most Beautiful Orthodox Church in the World?” The article links to a photographic report on Православие и мир: ”Освящение Кронштадтского Морского собора во имя святителя Николая Чудотворца,” which I highly recommend. I really like the chapel at the U.S. Naval Academy, but the Russkies have outdone Annapolis! The sobor’s council has a page on the church’s history and on the renovation efforts. There is much to lament in the news, but the developments in Russia are a cause for celebration. Glory to God! The “Americanism” of which Leo XIII warned in Testem Benevolentiae was far more a phantom concocted by fevered, ancien-régime European minds than a heresy that threatened Catholic faith in the United States. Fevered, ancien-régime European minds? Has Weigel no understanding of history? The man has no sense of the enemy. As everyone should know, the Communists destroyed much of the Russian Church’s material patrimony after the Bolshevik revolution.Thankfully, there were men with influence in the Party who were cultured enough to save many religious buildings and artifacts. The Soviets gave many of Russia’s most revered icons to state museums, which guarded them as objects of great historical and artistic interest. After the fall of the godless regime, the Russian Church has sought to regain ownership or at least access to confiscated temples and icons. For the past twenty years, politicians, churchmen, and keepers of the nation’s cultural heritage have argued about this troubled legacy. The bishops and priests maintain that the Church should regain its stolen property to use it for its original purpose. Museum curators want to preserve architectural and artistic treasures according to the highest standards of their field so that future Russian generations may witness them. Everyone has a reasonable request. When Aaron and I visited Russia a decade ago, we saw some felicitous and clever compromises. For example, the Tretyakov State Gallery has several of the most famous holy images in Russia, including my favorite icon—the beloved Our Lady of Vladimir. It is unthinkable that the museum would keep Russia’s most important icon in a secular exhibition space. Yet, it is understandable that the preservationists want to safeguard the material integrity of the icon. So, the Russkies agreed to display it in the neighboring temple that the museum owns and manages, the Museum Church of Saint Nicholas in Tolmachy. There, museum visitors may see the icon in its most appropriate context and Orthodox Christians may venerate the image in its proper setting. The “Museum Church” is a functioning chapel for the museum staff and for the neighborhood. It appears that this sort of cooperative arrangement—symphonic, one might dare say—has been replicated throughout the land. Just last month, the Ministry of Culture and the Moscow Patriarchate signed an agreement that allows art conservationists and the public access to property returned to the Church by the state. See “Russian Church and State Reach an Accord.” Good news, indeed. The Seattle Times published a lovely photographic article about the celebration of Pentecost at Saint Nicholas Russian Orthodox Church in Seattle. The greenery is beautiful and abundant; it makes me question my view on the proper liturgical color for the feast.